Do You Really Know Your Technology? Dr. William Paulsen, Chair of the APSF Committee on Technology, co-chairs the Technology Training conference. 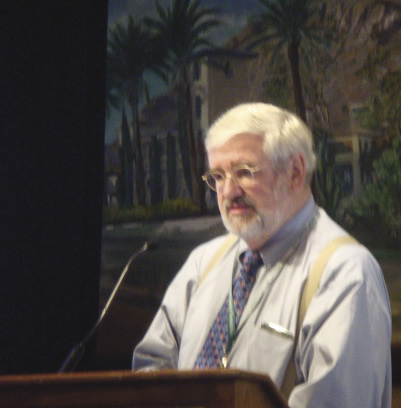 On September 18, 2013, in Phoenix, AZ, the Anesthesia Patient Safety Foundation convened a workshop to critically examine the importance of technology training in anesthesia. Dr. Robert Stoelting opened the conference with an introduction describing the need for anesthesia providers to be competent in their use of advanced medical equipment. Intrinsic to that competence is the assurance of training, education, and familiarity with these devices upon which we rely on a daily basis. To deny the importance of these basic tenets will most certainly result in “doing the same thing over and over again and expecting different results,” a concept which Einstein defined as “insanity.” Following Dr. Stoelting’s opening remarks, Dr. William Paulsen, chair of the APSF Committee on Technology (COT) and co-chair of the conference, reflected that the COT started to address technology training in 1996. Dr. Jeffrey Cooper, in 1984, published that lack of experience and unfamiliarity with equipment accounted for 63% of all critical incidents. In 1998, Dr. Robert Caplan published reports detailing how gas delivery systems are life support devices and catastrophic failures have occurred due to misuse. It is critical to recognize that training and competency for advanced medical equipment is important, substantiated by both direct and indirect proof. Manufacturers have long noted that technology training is a perpetual problem with very low rates of participation. Such training is vital when either new equipment or technology is introduced or when a new individual is expected to use existing advanced medical technology. Important principles include full participation in training, ability to understand device function and operation, ability to use the technology as often as necessary and often enough to maintain familiarity, knowledge of device safety features and how to avoid the potential for harm, and, finally, the ability to recognize when a device is not functioning properly and be able to troubleshoot to avoid harm. The majority of conference participants (74%) agreed that current advanced medical technology training is inadequate. 89% of conference attendees agreed that adoption of training requirements for advanced medical technology parallels the national discussion for patient safety and is a safety requirement on which “we” must deliver. Despite limited supporting literature, the conference participants overwhelmingly (97%) concluded that logic is compelling to require confirmation of competence before using unfamiliar and/or complex advanced medical technology that can directly impact patient care. Conference attendees rejected (79%) the proposal that the low incidence of equipment problems does not justify efforts directed toward advanced medical technology training and limited resources should be diverted to solving other safety problems. APSF partners with Industry to improve advanced medical technology training for anesthesia professionals. Panelists, left to right: Steven J. Barker, MD, PhD (Acting Chief Medical Officer, Masimo, Chair Emeritus, Department of Anesthesia, University of Arizona School of Medicine), Timothy W. Vanderveen, PharmD, MS (Vice President of the Center for Safety and Clinical Excellence, CareFusion), Saliha K. Greff, JD (Associate General Counsel and Chief Compliance Officer, Respiratory and Monitoring Solutions, Covidien), David Karchner (Director of Marketing, Perioperative Care, Dräger Medical), Kevin G. Tissot (Chief Engineer-Anesthesia, Life Care Solutions, GE Healthcare), and Carsten Bech-Jensen (Senior Clinical and Service Specialist, Marketing and Clinical Application, Anesthesia Care, Philips Healthcare). Foreground facing away, one of the authors of this article: Dr. A. William Paulsen, MMSc, PhD, AA-C (Chair of the APSF Committee on Technology). Speakers at the conference represented all key areas including provider perspectives, industry/manufacturer perspectives, institutional perspectives, training and educational perspectives, and regulatory perspectives. The speakers included Jeffrey M. Feldman, MD, MSE (division chief, General Anesthesia Children’s Hospital of Philadelphia), Matthew B. Weinger, MD (professor, Anesthesiology & Medical Education,Vanderbilt University), Nikolaus Gravenstein, MD (professor of Anesthesiology, University of Florida), Michael A. Olympio, MD (professor of Anesthesiology, Wake Forest School of Medicine), David Schlotterbeck, MSEE (moderator, Chair, National Council for Healthcare Technology Safety), Timothy W. Vanderveen, PharmD, MS (vice president, Center for Safety and Clinical Excellence, CareFusion), Saliha K. Gref, JD (associate general counsel and chief compliance officer, Respiratory and Monitoring Solutions, Covidien), David Karchner (director of marketing, Perioperative Care, Dräger), Kevin G. Tissot (chief engineer-Anesthesia, Life Care Solutions, GE Healthcare), Steven J. Barker, MD, PhD (acting chief medical officer, Masimo; chair emeritus, Department of Anesthesia, University of Arizona School of Medicine), Carsten Bech-Jensen (senior clinical and service specialist, Marketing and Clinical Application, Anesthesia Care, Philips Healthcare), R. Michael Boyer, DO, MS (moderator, associate professor, Department of Anesthesiology, Northwestern University Feinberg School of Medicine), Nancy G. Pratt, RN, MS (chief quality and patient safety officer, St. Joseph’s Health), Brian J. Thomas, JD (senior claims attorney, director of Risk Management, Preferred Physicians Mutual), Jerry Stonemetz, MD (past medical director of Anesthesia Services, Hospital Corporation of America), Bruce P. Halbert, PhD (consultant to APSF Executive Committee, Battelle Energy Alliance – Idaho National Laboratory Director, Nuclear Safety and Regulatory Research Division), David Gaba, MD (moderator, Professor of Anesthesia, Stanford University School of Medicine), Michael Argentieri (vice president, Market Development, ECRI Institute), Mary K. Logan, JD (president and CEO, Association for the Advancement of Medical Instrumentation), Patricia Adamski, RN, MS, MBA (director, Standards Interpretation Group, The Joint Commission), Julian M. Goldman, MD (medical director, Partners HealthCare, Biomedical Engineering Anesthesiology, Massachusetts General Hospital/Harvard Medical School), Daniel Hatlestad (clinical marketing manager, Perioperative Care, GE Healthcare), Jason R. Byrd, JD (director of Patient Safety, Hospital Engagement Network, Quality Division, Carolinas HealthCare System), Nathaniel M. Sims, MD (physician advisor, National Council for Healthcare Technology Safety), Anthony C. Easty, PhD, CCE-C, CCE (senior scientist, Baxter, Chair of Health Technology, University of Toronto), and Patricia Trbovich, PhD (academic research lead, HumanEra, University of Toronto). 93% of conference attendees agreed that when an anesthesia professional first joins an anesthesia group/practice, he/she should be required to demonstrate competence in the use of all advanced medical technology that will be used in his/her care of patients. Conference attendees (92%) overwhelmingly support the concept that the hospital privileging process include evaluation of training and competence in advanced medical technology before such a privilege be granted for physicians and other practitioners providing a medical level of care. 94% of conference participants agreed that industry should standardize (especially interfaces) advanced medical technology similar to the automotive industry. An overwhelming 97% of respondents agreed that no amount of training (voluntary or mandatory) will obviate the need for highly usable medical device user interfaces. 99% of conference participants agree that manufacturers should be encouraged to provide web access to user manuals and training information. Conference attendees (95%) agreed that advanced medical equipment should record button-presses and other information that can be used to improve user interface design, device performance, and training. 91% of conference attendees agreed that inclusion of training in the pricing of advanced medical technology should be part of every proposal to avoid the temptation to accept a lower bid but without a training feature. 95% of conference attendees agreed that technology training should have standardized elements across vendors. Conference participants agreed (89%) that ongoing professional practice evaluation data collection should include data on training and competence of the practitioner being evaluated. Conference attendees (84%) agreed that Maintenance of Certification in Anesthesiology (MOCA) requirements should include training and competency assessment on the use of advanced medical technology. A majority (77%) of conference attendees agreed that mandatory components of training should include advanced trouble-shooting simulations. 99% of conference participants agreed that there is a role for readily accessible computerized interactive training tools (such as tablet apps) for training health care providers. Conference participants (75%) agreed that evaluative tests embedded in computerized interactive training tools are a good platform to electronically document competency and assign recertification if appropriate. 72% of participants felt that hands-on-in-service training should be replaced with computerized interactive training tools. 91% of participants agreed that the APSF should encourage anesthesia professional societies to promote adoption of training requirements on the use of advanced medical technology. Sixty percent of conference participants were anesthesia professionals and 20% were representing the medical device industry. Five percent were risk management, hospital administration, or regulatory agencies, while another 5% were health care professionals outside of anesthesia. The majority of participants agreed that current in-service strategies are inadequate and low participation rates of clinicians are symptomatic of current flaws. Despite a lack of evidence to the contrary, 97% of participants felt that requiring practitioners to demonstrate their competence in using advanced medical technologies to care for patients was essential and paralleled the national discussion on patient safety. Participants rejected the concern that the low incidence of equipment problems doesn’t justify the “cost” of advanced technology training. Participants overwhelmingly agreed that advanced medical technology should be added to the hospital privileging process and to deny the use of such technology for patient care to anyone who has not demonstrated proficiency, including anesthesia professionals who are new to a practice. Conference participants supported the concept that industry should standardize their equipment, especially interfaces, that would permit a knowledgeable user of one brand of anesthesia machine to safely operate an unfamiliar machine from another manufacturer. The automobile industry has standardized cars such that a driver of a rental car can safely operate any manufacturer’s rental vehicle even though they might not understand all of the technologic features. In addition, participants overwhelmingly agreed that no amount of training can obviate the need for a highly functional user interface. Ninety-nine percent of participants want to have web access to equipment user manuals for emergency purposes and to have access to training materials. The vast majority of attendees would like to see equipment record button presses and other information to improve user interface design, device performance, and training, and participants (95%) would like to see standard elements across vendors in training programs. Eighty-four percent of the participants believe that MOCA should include training and assessment of competency in advanced medical technology, including device troubleshooting simulations. Conference participants agree (99%) that there is a role for readily accessible computerized interactive training tools, but they still want the assessment to include direct hands-on demonstration of the proper use. A choice of media would provide the best chance of reaching many anesthesia professionals with different learning styles and outside commitments, whether it is interactive web-based, an application for your television or phone, video, or print material. Ninety-one percent of participants would like the APSF to encourage anesthesia professional societies to promote adoption of training requirements on the use of advanced medical technology. In response to this conference, the emerging consensus, and the need to advance patient safety by the implementation of technology training initiatives, the APSF and the APSF Committee on Technology are currently working toward developing recommendations to these ends. These recommendations will appear in a future issue of the APSF Newsletter. Dr. Paulsen is professor of Biomedical Engineering and director of the Anesthesiologist Assistant Program in the School of Health Sciences at Quinnipiac University, and chair of the APSF Committee on Technology. Dr. Morell is a private practice anesthesiologist in Niceville, Florida, co-editor of this newsletter, and member of the APSF Board of Directors.